I'm hosting a contest for all ProIonic members to participate, winner gets Donator status on an account of their choice. There is a simple rule to follow, no making several forum accounts and posting on the thread. I will ask Tony to look at the forum IP's to make sure no one does this. If you make posts on several forum accounts, you will be disqualified. The Donator status lasts for a month, and has plenty of features, if you'd like to see what Donator status provides, read my "Life as a ProIonic Donator" thread. To participate, post a number from 1-100 below. I will use a random number generator online to roll and land on a number, if it lands on your number, you win... simple as that. 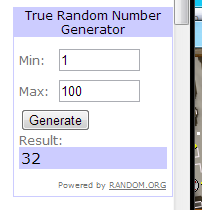 I will roll and generate a new number, until it lands on a number that was posted on the forum, if you don't win, do not be a poor sport about it either. Or I wont host anymore contests like this. Make sure you've read that posting multiple times is against the rules of the contest, same with making new accounts and posting. Same with using a VPN. I will know if you're cheating. POST BEFORE IT'S TOO LATE. If you're already donator, your status will be extended 1 month. Good luck to all you. You'll receive your status on Wednsday!